Recently, scholars suggested that an alliance capability could be viewed as a rare, valuable and difficult-to-imitate resource at the firm level in order to explain the differences in alliance performance between firms (Dyer et al., 2001). 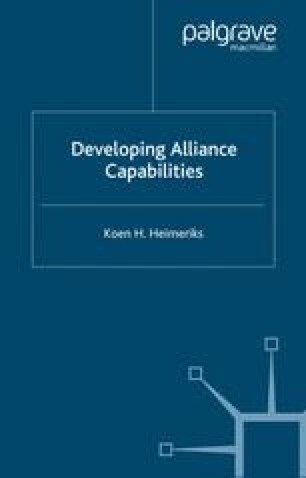 In line with earlier studies, we define an alliance capability as a firm’s ability to capture, share, disseminate and apply alliance management knowledge (see Chapter 3). This chapter analyses the role (groups of) mechanisms play in enhancing alliance performance. To do so, four groups of mechanisms are identified after which an explication is given of the reasons why that particular group is important for alliance capability development. In order to analyse if indeed these intra-firm mechanisms play an important role in enhancing alliance performance, a comparison is made between low- and highperforming firms using data from a survey of 192 firms worldwide.